No need to deal with the heat, just opt for the pick up service from Silom BTS Station, available free of charge! Was late for the massage but I called in earlier & the staff acknowledged & understand English well. The place was a little hard for the taxi driver to locate & so we had to walk further. Massage was really great & we received a free mini fragrance for the room to bring home as a gift. Take a break from the busy pace of everyday life and get some peace and quiet with a stop at Sook Sabai Spa in Bangkok. Conveniently located only a few minutes away from Saladaeng BTS Station, this spa is an ideal place for anyone looking for a bit of rest and relaxation! Choose from a variety of massage options, including a Thai massage, a Swedish massage, and even a massage that uses scented candles, all of which are sure to soothe your body and reinvigorate your mind. Simply select and book your preferred massage on the Klook website/app, call the spa directly to reserve your appointment once confirmed, and you're good to go! Once you arrive at the spa, take in their luxurious interior which combines Vietnamese and French design elements, before you enjoy your massage of choice. After the treatment, spend some time sipping on a cup of freshly-brewed tea, then spend the rest of day exploring Bangkok with your refreshed mine and soothed muscles! Get a free cup of tea before and after your treatment by booking through Klook! Was late for the massage but I called in earlier & the staff acknowledged & understand English well. The place was a little hard for the taxi driver to locate & so we had to walk further. Massage was really great & we received a free mini fragrance for the room to bring home as a gift. Was late for the massage but I called in earlier & the staff acknowledged & understand English well. The place was a little hard for the taxi driver to locate & so we had to walk further. Massage was really great & we received a free mini fragrance for the room to bring home as a gift. Great authentic thai massage! We were greeted with a welcoming tea that we really enjoyed. The therapists were kind enough to ask us how we feel during the massage session so they can do better. We also had a coconut jelly dessert after the massage session. Great authentic thai massage! We were greeted with a welcoming tea that we really enjoyed. The therapists were kind enough to ask us how we feel during the massage session so they can do better. We also had a coconut jelly dessert after the massage session. Visited with my mom after walking several hours. Our legs needed a good massage, and their foot massage was heavenly!! The staff at the reception was very friendly and helpful, I couldn’t feel any more accommodated. They first gave us welcome tea and hand towel to relax the heat. Afterwards, washed our feet, moved to the chair(the seat is REALLY comfortable, I wished I can sleep on it the whole day), covered our eyes, and started massaging. 10mins shoulder massage at the end was excellent too! Visited with my mom after walking several hours. Our legs needed a good massage, and their foot massage was heavenly!! The staff at the reception was very friendly and helpful, I couldn’t feel any more accommodated. They first gave us welcome tea and hand towel to relax the heat. Afterwards, washed our feet, moved to the chair(the seat is REALLY comfortable, I wished I can sleep on it the whole day), covered our eyes, and started massaging. 10mins shoulder massage at the end was excellent too! 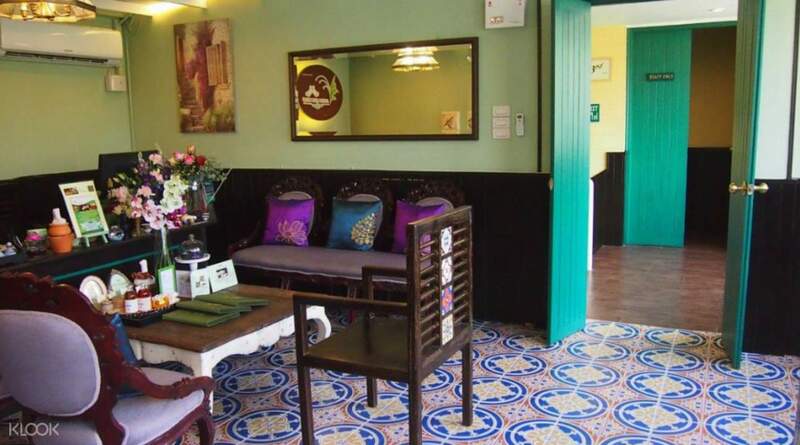 Nice environment, the staff are professional and massage skills are good and comfortable. But felt disappointed that the coconut jelly was finished and could not eat it again this time. Nice environment, the staff are professional and massage skills are good and comfortable. But felt disappointed that the coconut jelly was finished and could not eat it again this time. Cozy little spa in the city. Staff were friendly and accommodating. Before you start, they ask you to fill out a form where you can indicate the body part where to focus and avoid when doing the Thai massage. Cozy little spa in the city. Staff were friendly and accommodating. Before you start, they ask you to fill out a form where you can indicate the body part where to focus and avoid when doing the Thai massage. We had a very relaxing one hour foot massage. The place itself is set up in a way which conveys relaxation and after a day of walking all over Bangkok it was just what we needed! We had a very relaxing one hour foot massage. The place itself is set up in a way which conveys relaxation and after a day of walking all over Bangkok it was just what we needed! Great service by the owner as well as the worker! Manage to call the owner to change the time and she is able to accommodate our needs despite last minute changes! Recommended! Great service by the owner as well as the worker! Manage to call the owner to change the time and she is able to accommodate our needs despite last minute changes! Recommended! they have a shuttle tuktuk to this place. the massage that we opted for was good. they have a shuttle tuktuk to this place. the massage that we opted for was good.